Every few years an artist comes along that is regarded as a country music savior, or in other words, an artist that resets the genre back to its roots while simultaneously pushing it forward. Acts such as Randy Travis, Keith Whitley and Dwight Yoakam did this in the 80’s in response to the Urban Cowboy fad. Most recently, Jamey Johnson was rightfully lauded as the real deal in a sea of Ride a Horse Bro-Country crap. Last year Sturgill Simpson burst on the scene with his fantastic record High Top Mountain. It ended up on many year end best of lists and was regarded as a triumph of true artistic authenticity. Simpson is not putting on any airs. He’s as real as it gets. Simpson’s new collection, Metamodern Sounds in Country Music, picks up where High Top Mountain left off and climbs to new heights. This is an artist and songwriter at his creative apex. Singing about heartaches, booze, pills, Appalachain life and telling stories in a voice that echoes both Waylon Jennings and Vern Gosdin at times, Simpson delivers a collection that is everything great about country music. Each track is an homage to the best influences in country music, without pandering or sounding like a carbon copy. This is a fresh take on familiar (and fresh) subjects that is produced in a very cool way. It’s an album of deja vu. You feel like you’ve heard it before, yet you can’t place your finger on it because it’s brand new. Simpson experiments with a wide range of sounds and styles to produce an aural landscape that backs his biting lyrics. Such as on “Voices” where he delivers the gem “A picture is worth a thousand words, but a word ain’t worth a dime…”. A double entendre commentary on the subject matter of the song and the visual nature of modern music versus the plight of the modern songwriter. Lead single and lead-off track “Turtles All the Way Down” distills modern political talking points into a common sense approach that extols the Beatles-esque message that all you need is love. Juxtaposed with enough drug references to make both Keith Richards and Willie Nelson blush, Simpson proves himself a writer immune to artistic constraints. If there is a story in his heart, it’s going to find its way to his pen and onto a record. Perhaps the most buzzworthy song on a collection full of them is Simpson’s cover of the 80’s New Wave hit “The Promise” by When In Rome.” Simpson turns the song on its ear and delivers an emotional knockout. The opening lyrical salvo “cleaning out the darkest corner of my mind…” on the psychedelic-tinged “It Ain’t All Flowers” cuts to the undercurrent of the record. This is raw, real and genuine country music. This is music for the many, many country fans that crave more than lowest common denominator tripe about trucks, bonfires, backroads and parties. This isn’t alt, Americana or Texas. This is country music. The kind that you used to be able to find on the radio dial. Metamodern Sounds in Country Music is a game-changer. Easily the record of 2014. 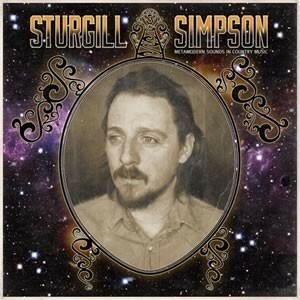 I just bought Sturgill’s album today in Edinburgh,Scotland,and I couldn’t hhave written a better review if I spent a week on it.This man sings about Jesus and Buddha and himself is a true saviour, as has been said,of country.How do I sign up for that alien surgery? Just listened to this records yesterday for the first time absolutely the best record i’ve heard this year so far. Country as it is meant to be done ! Did he change his name…he looks like dennis ferguson sr.
Did he change his nahme…he looks like dennis ferguson sr.
hints for aspiring writers? I’m planning to start my own website soon but I’m a little lost on everything.